A friend recently asked me where I get my food inspiration from. I never really thought about this… I like to experiment with food combinations I already know by using them in novel ways and frequently come up with new ones as I cook. But come to think of it, I actually take pleasure in eating out and often attempt to recreate the dishes I’ve had at a restaurant for home use. It’s a great way to reinvent the home menu a little and give credit to the great culinary minds out there, who thought of the dish in the first place. My most recent challenge was set by Mr Chipconnoisseur, following a visit to Etch. He fell in love with the burnt spinach lasagne at first sight bite, and I have to be honest that from a little tasting I had, I fell in love with it too. It has to be one of the best modern takes on this dish I’ve ever had. The pasta was fresh and silky smooth – there is no substitute for pasta made from scratch. 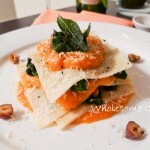 The spinach and pumpkin puree were wonderfully buttery with a slight hint of sage and pecorino. And the addition of hazelnuts (which I am crazy about at the moment) was the icing on the cake for me. The restaurant’s fresh food philosophy delivers on its promise: you can taste the freshness of each ingredient in every single bite. 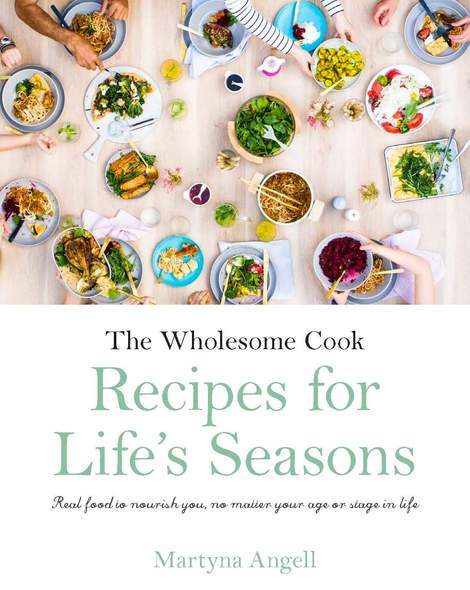 If there is a Foodie Heaven – this is what they serve at meal time. No wonder Mr Chipconnoisseur was keen to have it again, and so soon, but attempted by me at home. The pressure was on. And according to my own judging panel of one, my home cooked version turned out pretty delicious too. I should say that this is not the original recipe for the dish, but merely my interpretation of what I tasted on the evening. It’s a sketch, if you like – a tasty reproduction and a fallback option if you are unable to get to taste the real thing. You can make the pasta from scratch, but if you're stuck for time you can use fresh store-bought lasagna sheets. Inspired by a visit to Justin North's Etch restaurant. Start by making the pasta dough as it needs to rest. Mound the flour in a large bowl. Make a well in the centre and break in the egg. Whisk with a fork to incorporate the flour until the dough is workable by hand. You may need to add some cold water if the dough is crumbly (a teaspoon at a time) to ensure the dough becomes slightly more pliable, soft and smooth. Knead for about 8 minutes or until the dough is smooth, elastic and slightly glossy. Cover with a tea towel and leave to rest for 30 minutes. To make pumpkin puree, chop pumpkin into 2cm cubes and place in a saucepan. Add water and boil uncovered until pumpkin becomes soft. Drain excess water. Add 1 tbsp butter and blend with a stick blender. Set aside. The dough should be ready now. Divide dough into 4 portions. Work with one portion at a time, keeping the others covered with plastic film. Flatten the dough out onto a lightly floured surface and roll out from centre to the outer edges. When the dough is about 5mm thick, fold it in half and roll out again to the same thickness. Repeat this process 3 more times - it will activate the gluten and ensure the pasta is smooth and soft once cooked.For the final roll try to make the rolled out sheet about 2mm thick and more oval in shape. Dust lightly with flour during the process if the dough sticks to the surface or pin. Using a sharp knife, cut the sheet into a rectangle and leave uncovered on a wooden cutting board to air-dry slightly. Repeat with the other portions. Bring a large pot of water with 1/2 tsp sea salt to the boil. Place pasta sheets in the pot and cook for about 3 minutes or until the pasta is just al dente. In the meantime, heat remaining butter in a saucepan until bubbling. Add sage leaves, allow to crisp up. Remove onto paper towel to drain excess oil. Add in hazelnuts and spinach into the same pan. Stir well until the spinach is wilted. Place pumpkin back on the heat to warm through. Drain pasta and cut sheets into squares. To serve place 1 tbsp of pumpkin mash on the bottom of the plate. Sprinkle with pecorino. Place 1 lasagne square over the pumpkin. 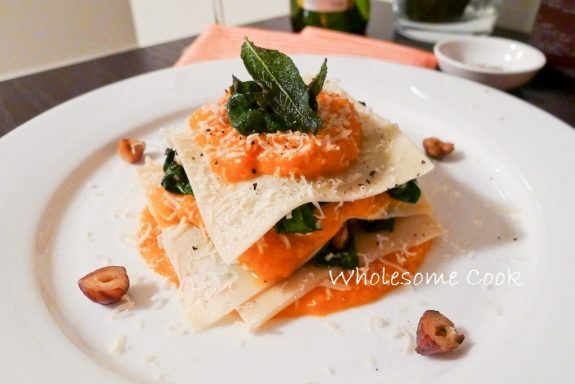 Layer with 1 tbsp pumpkin mash, 2 tbsp spinach mix, 2 sage leaves and pecorino. Repeat the layering once more and then again on the top of the sheet. Serve with freshly ground black pepper.